Milena has worked in marketing and communications for over 20 years, and her experience includes working with television stations, newspapers, radio stations, digital media, and entertainment, among others. During the last 10 years, Milena worked directly with one of the top ten media groups in Brazil, GRPCom, formed by a newspaper company, radio stations and a TV broadcasting company (RPC) affiliated Rede Globo. There she has been working in different areas of marketing and led major projects in events, branding and business intelligence strategy. She currently leads a team of 40 people located in several areas of communication and branding, customer relations and business intelligence. Prior to her current role, Milena was a Corporative Marketing Director, and was responsible for developing marketing strategies and identifying attractive opportunities to leverage the company’s image. 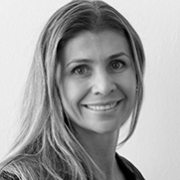 Milena has a BSc degree in Business Administration from UNIFAC, a Masters level Postgraduate in Hospitality Management from SENAC Sao Paulo, and a Master in Business Administration, Executive MBA from Fundação Getúlio Vargas.